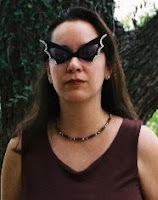 Cynthia Leitich Smith is the New York Times and Publishers Weekly best-selling author of ETERNAL, TANTALIZE, and BLESSED, Gothic fantasies from Candlewick Press. Cynthia has also published YA short stories and award-winning books for younger readers and may be found on the Web at www.cynthialeitichsmith.com. When I reflect on my childhood comic reading, I recall my father driving me on Sundays to the local convenience store for a handful of superhero, horror and sci fi books. I recall how—at a time when girls were urged to “let the boys win”—Wonder Woman informed me that I could be my own hero. Graphic-format fiction helped foster my love of story, my self-confidence, and taught me a great deal about the possibilities of marrying text and illustrations. When it first occurred to me to talk to my agent about adapting my YA Gothic, Tantalize (Candlewick, 2007, 2008), to graphic novel form, I approached the subject and then the process with respect and lessons learned from decades of reading and study. My most important decision was to tell the story from the first point of view of a different narrator. 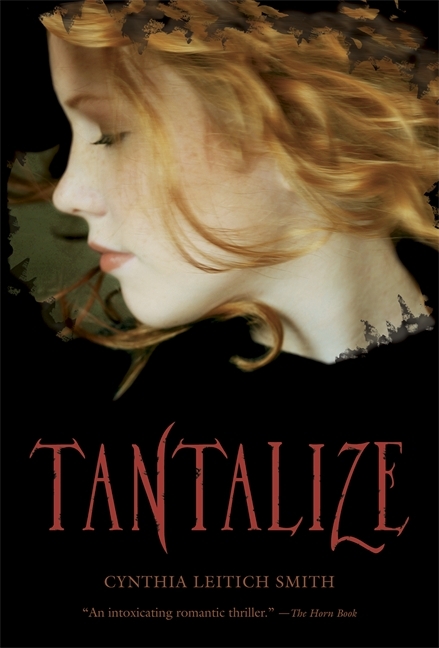 Tantalize, the prose novel, was told from the perspective of Quincie P. Morris, a teen who’s trying to help save her family’s struggling Italian restaurant by re-launching it with a vampire theme—a great idea until some real vampires show up. Quincie’s best friend (and true love) Kieren Morales is a human-werewolf hybrid, unfairly suspected of murdering the chef. It’s Kieren that I chose as my hero for the graphic version of the story. With Kieren now foremost in my mind, I began by re-reading Tantalize and listening to the audio production from Listening Library. Then I opened the book again, and began translating the existing scenes in which he appeared into a script format, shifting the point of view. I had to think about pacing in a new way, clip much of the connective tissue, and trust the illustrator to fill in the setting as well as much of the emotion and mood. At twelve thirtyish on a Thursday night—make that Friday morning—the weekend was already in full swing. Music aficionados congregated outside the clubs, tourists stumbled out of margarita bars, and the shops had been closed tight. The Capitol Motel, the Spanish-style motel, and the ’50s-retro one next door to it all posted No Vacancy. The sky was murky, like it had been covered by a smoky blanket. It had rained earlier that evening, and the asphalt felt slick in places. Stumbling on the curb, I nearly dropped my uncle’s chicken soup. Watching where I was going couldn’t hurt. The sporadic traffic to my right, storefront windows to my left. Dull security lights, crisp neon. What was I thinking, I wondered steps later, walking by myself at this hour? I hated to admit it, but Brad had a point. He was just so hard to read, and then he’d hit too close to home. Reminded me of what I was trying to forget. The investigation. Kieren as a possible suspect. A murderer on the loose. Brad seemed to think I was in some kind of denial, and if that was true, so be it. Denial had been keeping me functional. It was working for me. Or at least it had been. I paused, considering. Brad would never hear me knocking at the front door, and it seemed safer to stay on the sidewalk with the crowd than go around the building by myself. Besides, I hated the thought of crawling back. Passing a couple of bikers (the kind that wore leather, not the kind that won The Tour de France), I told myself I was worrying for nada, but I felt watched. I squinted, scanning the flyers stapled to a pole. Among those announcing “roommates wanted,” an anti-death-penalty rally, and a band called The Screaming Head Colds, were others with black-and-white photos of missing people and pets. At the next intersection, I glanced behind me and spotted a male figure, half obscured by a giant yucca, advancing fast. Was he after me, I wondered, or just trying to make last call? There hadn’t been another murder since Vaggio’s, and that had been not quite two weeks earlier. But… Damn, why hadn't I waited for Brad to give me a ride? Maybe the drinking had impaired my judgment. My keys extended from between each of the fingers on my right hand. My house waited another block away. I glanced back, but a laughing group of partyers had spilled onto the sidewalk between me and my would-be pursuer. Setting the bag beside a row of newspaper dispensers, I decided, tipsy or no, to make a run for it. If my uncle could go out with his girlfriend, he could live without his soup, and carrying it would slow me down. I passed a petite woman in blond pigtails, lugging a guitar case. A guy with green hair, wearing chains on his wrists and as a belt. The sidewalk was uneven, downhill to the stoplight. Then I turned left, hoping whoever it was hadn’t seen me as I continued up, up at a steep incline. A canopy of trees, sleeping houses lay ahead. I didn’t get twenty feet before I heard footsteps closing in. Panting. Something grazed the small of my back. I turned to strike back—to hit, kick, bite, if I could sink my teeth into anything. Knowing I’d never outrun him. My fist tightened around my key chain, and I aimed for an eye. Swinging too hard, I missed, throwing my whole body off balance. His, too. Our legs tangled, and we collapsed in a heap on the damp sidewalk. My teeth cut my tongue on impact. Pain surged up my limbs, my side. Kieren? I scrambled away from him. He climbed to his feet, offered me a hand up. That night, Kieren is standing at a distance, watching Quincie leave work. It’s a night-life scene on South Congress. Shops are closed, but restaurants and clubs are still active. There’s a full moon. Quincie continues down the gradual, multi-block hill. but not without using Wolf speed. And I can’t risk someone seeing me do that. Quincie is partly obscured—by the crowd, etc.--from Kieren’s view. Quincie threads her house keys through her fingers like claws. She’s aware of being followed but can’t get a good look at who’s behind her. Likewise, Kieren is far enough behind that he’s just catching glimpses. Quincie turns west up the hill, away from the commercial district and toward the established neighborhood behind it. She’s walking briskly up the hill, in the middle of the street. Kieren reaches for Quincie, just brushing her back. Quincie panics, not realizing it’s him. She swings at him with the key-laced fist, aiming for an eye. But she swings too hard and misses, throwing her body off balance. He loses his balance, too. They land on the street. Kieren is surprised and hurt by her reaction. Quincie is still sort of freaked out, but now embarrassed by it. Kieren stands and offers Quincie a hand up. You see how much came out? How Kieren’s perspective changes the scene and how his voice is more terse and instinctive? Then I had to fill in the blanks. Kieren spends much of the prose novel off-screen. I took clues from that book to flesh out what he’d been doing during all that time. Certain secondary characters—his family, his pals the werearmadillo Travis and wereopossum Clyde, and his English teacher Mrs. Levy—got more screen time, so to speak. It shaped up as a romantic, paranormal, murder mystery with (hopefully) solid dual-gender appeal. The next step was Candlewick’s signing of illustrator Ming Doyle, who began by doing preliminary character sketches of Quincie, Kieren, and the antagonist, Brad. Once she and the house had settled on a final look for each, Ming began sketching in earnest. Our editor, Deborah Wayshak, later sent me the sketches and asked me to put together notes. Immediately, I could see text that should be cut. I also found opportunities—Quincie and Kieren’s kiss, the introduction to Sanguini’s—where the art could be expanded for pacing and impact. Deb and I then compared notes on a page by page, panel by panel basis. My predisposition was to get out of the way of the illustrator wherever I could. So, I erred on the side of cutting, while mindful of the flow and logic of the story. We repeated this process twice, tweaking as needed. “Darn good,” I’ll take that. I look forward to the release of Tantalize: Kieren’s Story in August 2011. TANTALIZE was a Borders Original Voices selection, honored at the 2007 National Book Festival, named to YALSA’s Popular Paperbacks list, and The Horn Book called it "an intoxicating romantic thriller." ETERNAL was a YALSA Teens Top Ten nominee, featured at the Texas Book Festival, and Publishers Weekly said, "…readers should be hooked by this fully formed world, up through the action-packed finale." It debuted at #5 on the New York Times best-seller list and #13 on the Publishers Weekly best-seller list. BLESSED was cheered by The Horn Book Magazine as "A hearty meal for the thinking vampire reader." Kirkus Reviews calls the world, "wild and ultimately fascinating" and says of Quincie and Kieren, "...the pages fairly smolder in describing their attraction to one another." This sounds like a fascinating process, and this was a very helpful post. Does anyone have experience with intermingling regular and graphic novel chapters in the same text? That's kind of neat about not simply retelling the story, but expanding the story for those readers who've also read the prose novel. That's so awesome that people get to read the story from both POVs, depending on which medium they pick. Mmmm, I love graphic novels. Thanks for giving us an example of the changes. Thanks for sharing the process. So interesting the changes to the POV and the length of the text. Having been in law school, it's funny how you found something useful to creative writing there. Love your blog.